As winter approaches and the temperature outside plummets, people begin searching for ways to keep a little warmer without cranking the thermostat up and spending their hard-earned money. Some choose to wear more layers. Others share body heat. Some even try the warm-clothes-right-out-of-the-dryer method. But for men, there is always one tried-and-true solution: facial hair. What better time for some facial hair than November: not only do you get the extra warmth, but it coincides with Movember, a prostate cancer awareness campaign. While the Movember idea isn’t new, there are few people who know the reason behind it. The idea is for men to raise awareness of the risk of prostate cancer by growing moustaches and raising money for prostate cancer research through donations. In order to gain more publicity for the cause, the KSA has put together its own Movember team, led by team captain, Chelsea Campbell — the KSA’s club and events coordinator — and KSA marketing and communications coordinator, Nathan Griffiths. So far promotion for the team has been limited but should pick up following the Oct. 28 Halloween costume contest. So far the KSA’s team, aptly named the “Hairy Lipped Eagles,” has 13 members and has only $50 worth of donations but they are looking for more support. There will be a Movember dodgeball tournament held on Nov. 19 between 2 and 7 p.m. The KSA is looking to get at least six teams of three for the event, with a minimum $30 donation per team, said Griffiths. As well as the tournament, the KSA and the GrassRoots will donate all Nov. 25 sales from people with a moustache, real or fake, to Kwantlen’s Movember team. “There’s also our Facebook campaign, trying to get people to update their profile picture every day as their moustache grows in,” said Griffiths. 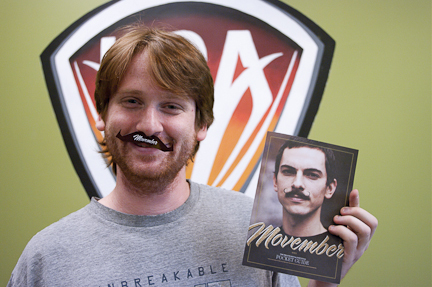 If you would like to join or donate to the KSA’s Movember team you can do so at the Kwantlen team site.